Violence, whether in the form of war, genocide or terror, has often been presented as a tool of peace. But living in a continuous state of blood thirst, humankind is suffering tremendous psychological damage, making peace elusive. DO the tense thoughts of these influential men have a bearing on the contemporary world? Their lives were linked with the most cataclysmic forces of the century, Nazism and racism. In 1938 at the age of 82, Freud had to flee his native Vienna after the Nazi occupation. The preacher-activist King confronted racialist bigotry in a non-violent struggle that cost him his life, but changed America. 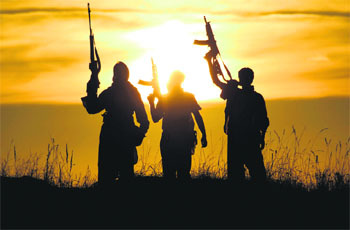 Of what relevance are their ideas on war and violence? Is terror a fringe phenomenon or has it long been part of what we call the mainstream? We would be foolish to ignore these questions. The twentieth century witnessed 175 to 250 million deaths on account of war and genocide. The proportion of soldiers to civilians killed declined from 43 per cent in the First World War to 28 per cent or less in the second (which cost some 60 million lives). The distinction between soldiers and civilians evaporated — terror-bombings were committed by all sides in the Second World War. After 1945, people believed in a new era of peace. This was shattered by the Korean War and developments in Palestine, Malaya, Indonesia, Kenya and Vietnam; not to mention Biafra, Iraq, Rwanda and Yugoslavia. George Orwell summed it up well — war, he said in his dystopian novel 1984, is not meant to be won but to be continuous. The psychological damage resulting from so much killing can only be guessed at. Every so often an Indian businessman uses Hitler’s name to attract commercial attention and is surprised at the reaction. Wasn’t Hitler a famous fellow and an ally of Netaji Subhas? He was indeed. He also criminalised the German state in its entirety. ‘The very first essential for success’, said Hitler in Mein Kampf, ‘is a perpetually constant and regular employment of violence.’ That some Indians see him as a statesman is a pointer to our own psychic ailments. The most colossal bloodletting in history carries no meaning for us. However, the Hitler regime was not only the prime example of state terror. It was also the first to base itself on the doctrine of racial purity, an idea it radicalised to the point of annihilation. After the passage of racial laws in 1933, it began transferring Jews, Romani and blacks to concentration camps. During 1939-41 about 100,000 mentally sick and incurable Germans were killed by state order. Thereafter the regime built death factories for Jews from all over Europe to be sent for extermination. Over 5 million were gassed to death in camps such as Maidanek, Buchenwald and Auschwitz. Firms such as IG Farben, Siemens and Bayer were involved in the genocide. Even today the Nazi genocide of the Romani (also known as gypsies) remains largely unspoken. These nomads of Indian origin had always been subject to racial hatred, forced settlement and enslavement. Some of this continued into the modern era and even under communist regimes. Early in 1940, 250 Romani children from Czechoslovakia were murdered with the new Zyklon-B gas at Buchenwald. On December 16, 1942, Himmler ordered all Romani in Germany deported to Auschwitz for extermination. There were an estimated 3 million Romani in German-controlled territories at the height of the Nazi regime, of whom a third to half were murdered. The other marker of the age of extermination was the atomic bombing of Hiroshima and Nagasaki in August 1945. Up to 150,000 Japanese civilians were burnt to death in these two cities within minutes, and tens of thousand died of radiation later. The bombing was sought to be justified in terms of lives ‘saved’ by avoiding an invasion of Japan. These arguments have been rebutted by many historians who point to America’s strategic goal of countering Soviet interests and testing the newly developed weapon. Leaving that aside, the nuclear explosion was a horribly fitting conclusion to the most destructive war in history, a war seen as ‘total’ because it pitted entire populations against one another. The most fearsome precursor to India’s Independence was the Calcutta killing of August 1946. Between five to ten thousand people were killed under the ministry of the Muslim League’s Hussain Suhrawardy. In October there were massacres in Noakhali, followed by a pogrom in Bihar under a Congress ministry. India and Pakistan were born amidst genocide. About 15 million people were forced to migrate. The communal ‘cleansing’ of Punjab’s population was catastrophic. Up to a million people were killed in 1947. After that there were massacres of Muslims in Hyderabad (India) in 1948 and of Hindus in East Pakistan in 1949 and 1950. The cycle of violence continued for two years. Perhaps it never really ended. Then there was the drama surrounding Gandhi’s murder. His last fast in January 1948 was not about payments to Pakistan, but for the restoration of the shrine of Bakhtiyar Kaki at Mehrauli and for communal peace. Had this fast not succeeded there would have been a Babri Masjid-like situation on the outskirts of Delhi. His assassination was a sad rehearsal of the ghastly Indian tradition of founding a new edifice upon a blood sacrifice. In 1965, fresh doubts about V.D. Savarkar’s involvement led to the appointment of an inquiry commission headed by Justice Jivanlal Kapur. His report (1969) noted the negligence of the police and concluded that the facts undermined ‘any theory other than the conspiracy to murder by Savarkar and his group.’ However, in 2003 the Indian government installed his portrait in the Lok Sabha. Evidently our MPs still revere Gandhi’s assassins. Has India transcended the violence of 1947, or has it entered our DNA? The constitution guarantees the lives and liberty of citizens. But thousands have died in riots since then, and the failure to punish the perpetrators has eroded this guarantee. These incidents are identifiable as genocide under the UN convention of December 1948. We face a relentless assault on democratic values and institutions. Sections of the ruling class habitually deploy violence to pursue their ends. Communal tension is brazenly instigated to gain power. The violence unleashed during elections or land-grabbing operations is colossal in scale. India abounds in private armies, some of which portray themselves as ultra-nationalists. Everyday propaganda prepares us for the militarisation of civil society. Entire communities are held responsible for crimes committed by a few. Wounded sentiment has become the most popular mask worn by hooligans. Democracy is being bypassed via a parallel system of representation based on community. The repeated instigation of retributive violence or the threat of it has become endemic. Along with other factors, this accelerates the criminalisation of India’s polity. Concepts such as democracy, secularism and the rule of law are in danger of losing their meaning. Gandhi referred to the use of the atom bomb for ‘the wholesale destruction of men, women and children as the most diabolical use of science.’ ‘There are two kinds ofshastras (weapons) in the world’ he said, ‘one satvik and the other rajasik, one conforming to dharma and the other not conforming to dharma. The shastra of the atom bomb does not conform to dharma`85 It usurps the place of God.” Those who demur at his language may remind themselves of Robert Oppenheimer’s remark that physicists had come to know sin. Physics and metaphysics are not that far apart. The use of science for destructive purposes has pushed humanity to the brink. The contempt for life is the hallmark of modern nihilism. In one of the first reflections upon Nazism’s death factories, Hannah Arendt wrote: ‘In their effort to prove that everything is possible, totalitarian regimes have discovered`85 crimes which man can neither punish nor forgive.’ About concentration camps, she noted the irrevocable rupture that the discovery of these ‘holes of oblivion’ had wrought in history: ‘Modern politics revolves around a question which, strictly speaking, should never enter into politics, the question of all or nothing: of all, that is a human society rich with infinite possibilities; or exactly nothing, that is, the end of mankind.’ When the philosopher Karl Jaspers rejected the idea of casting Hitlerism in the light of some satanic greatness, she agreed with him, but insisted that what had happened in the camps was not a case of humans killing other humans for human reasons, howsoever horrible. What had occurred, said Arendt, was ‘the organized attempt to eradicate the concept of the human being.’ This is the closest we will ever come towards understanding modern exterminism. The phenomenon was not restricted to theatres of war — the whole world was enveloped in it, and we live in its shadow. The idea that only violence may inaugurate new beginnings, that a just order may only be validated by blood is our deadliest illusion. Yet this idea is celebrated in our favourite ideologies. Violence is productive of nothing but more violence. Freud was insightful in his observation about the stability of our primeval instincts. But we had better control them. Because, as Gandhi and King warned us, the choice today is the one between violence and annihilation.